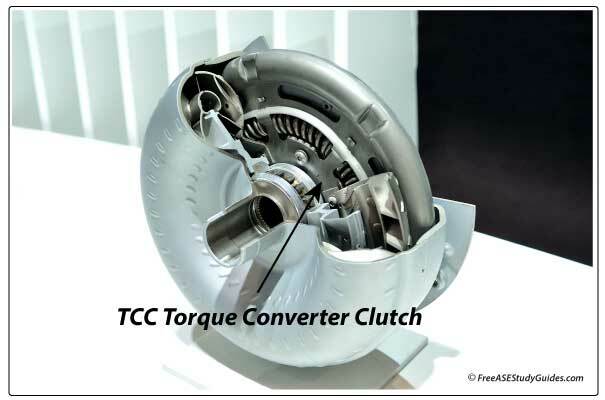 The torque converter clutch creates a one to one connection between the output of the engine and the input of the transmission. This increases fuel mileage and reduces transmission fluid temperatures. This is because of normal torque converter slippage between the impeller and turbine. This slippage consumes power during the coupling phase. Locking the converter shell to the turbine shaft prevents this slippage from occurring. The clutch is inside the torque converter case; it contains a friction material that locks the turbine shaft to the inside of the torque converter’s shell. It’s controlled by the TCM. It sends a pulsed voltage signal to the TCC solenoid. The solenoid moves a valve that sends pressurized fluid to the clutch circuit, engaging the TCC. When the clutch is disengaged, the torque converter operates normally, allowing the engine to rotate without stalling while the vehicle is slowing and coming to a stop. While the vehicle is slowing and approaching a stop, TCC application is undesirable, because like the clutch on a manual transmission it will cause the vehicle to stall. The clutch plate contains a spring and hydraulically controlled pistons. The pistons move the clutch disk into contact with the shell, providing a 1:1 mechanical connection. It’s only engaged at certain times, depending on conditions like speed and temperature. The TCM makes these decisions based on input from various sensors. It compares the information to factory preset tables before engaging or disengaging the TCC. The ECT sensor monitors engine coolant temperature. The TCM will not engage the TCC until the engine warms to a preset temperature. The MAF sensor monitors the volume of air passing through the air tube. The TCM will not engage the TCC while the engine is accelerating. Most transmissions will disengage during deceleration to prevent high emissions. The TP sensor indicates the throttle plate angle. If the driver were to suddenly accelerate to wide open throttle the TCM will disengage the TCC and downshift. The TFT monitors transmission fluid temperature. The TCM uses this information to engage or disengage the TCC according to transmission fluid temperatures. The TCM controls the TCC solenoid. If the solenoid were to stick closed, the TCC will stay engaged while slowing the vehicle. This will cause the vehicle to stumble and eventually stall. If the TCC solenoid were inoperative, the transmission fluid temperature may increase and fuel economy would suffer.